Choose from 5 brave heroes to conquer a perilous dungeon! Use strength, magic and agility to defeat fearsome enemies and overcome the traps that will stand in your way. Surviving an encounter will give you the benefit of nice loot, and will make you more powerful for the next... reach the bottom of the dungeon and maybe you will overcome its guardian! 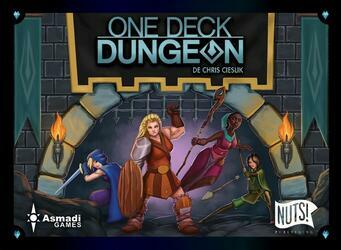 One Deck Dungeon is a solo, or cooperative game for 2 players. Possibility to play with 4 players by combining 2 boxes.